Saint Nicholas privately giving to save poor girls from slavery. As much as I love the Reformed tradition, some of its more extreme instincts, in my humble opinion, lead it to throw out the baby of the communion of the saints with the bath water of Roman Catholic superstition. One case in point is the memory and example of the saints of the past. Not wanting to retain a Romanist veneration of the saints, we neglect the important and edifying discipline of gleaning from the history of the church the graces of the saints conveyed to us in the annals of church history. This may lead us to keep an eye on the historic church calendar, but we do not have to allow the entire worship of Christ to be distorted by this. There are ways to corporately remember the faith and works of the saints without violating the regulative principle of worship. What it takes is a little ingenuity on the part of Reformed congregations—their members under the informed supervision of their sessions. The Westminster Confession of Faith, chapter 26, “Of the Communion of Saints,” presents the biblical principles that go along with the communion of believers with Christ by the Spirit through faith, and with each other in love. With regard to this section of the confession, there are gifts and graces to be communicated by one believer to others. This does primarily intend to apply to all living believers who are physically present among the saints in their generation of the church militant. But just as our confession transmits to us the corporate Reformed understanding of biblical faith, piety and practice, so can church history communicate to us the benefit of the gifts and graces of great Christians of the past who are now numbered among the church triumphant in heaven, with whom we are lifted in the Spirit on a weekly basis to join them in worship of Christ. In one sense, this takes place all the time in one Reformed church or another as pastors illustrate the teachings of Scripture with examples of the works and experiences of saints of the past. By so appropriating their examples in the exposition and application of the Scriptures to us, I submit that we are benefiting from the gifts and graces of these historic saints, and so are experiencing the communion of saints even with them, if only in a sense. If the teaching ministries of Calvin, Luther, Spurgeon, Warfield, Machen, etc., continue to build up and instruct the church, why not the lives and works of those who published nothing, as their lives are recorded in church history? One of the Scripture proofs in the section of the confession above is Romans 1:11-12,14. In this passage, the apostle Paul expresses his desire to commune with the saints at Rome. For I long to see you, that I may impart to you some spiritual gift to strengthen you—that is, that we may be mutually encouraged by each other’s faith, both yours and mine. I do not want you to be unaware, brothers, that I have often intended to come to you (but thus far have been prevented), in order that I may reap some harvest among you as well as among the rest of the Gentiles. I am under obligation both to Greeks and to barbarians, both to the wise and to the foolish. So I am eager to preach the gospel to you also who are in Rome. If Paul desired to impart a spiritual gift to the Romans in person, for his strengthening with the Romans in their mutual faith in the Person and Work of Christ, he certainly did impart such not only to them, but also to all Christians who would follow to this present day, twenty centuries later in his writing the most comprehensive exposition of the gospel of Christ in his letter to the Romans. Paul’s grace was the grace of apostleship. Other ministers of the gospel have spiritual gifts to impart which are outworkings of this Pauline gospel. In the case of Nicholas, the grace of generosity to the poor among his parishoners has been communicated to us today through sixteen centuries of church tradition. If we may demythologize the traditions of St. Nicholas’ “wonder-working” intercessions, among other fanciful traditions, what we find remains is the kernel of a godly example of generosity on a par with that first lived by Christ in his state of humiliation. As Paul wrote, “For you know the grace of our Lord Jesus Christ, that though he was rich, yet for your sake he became poor, so that you by his poverty might become rich. (2 Corinthians 8:9, ESV). 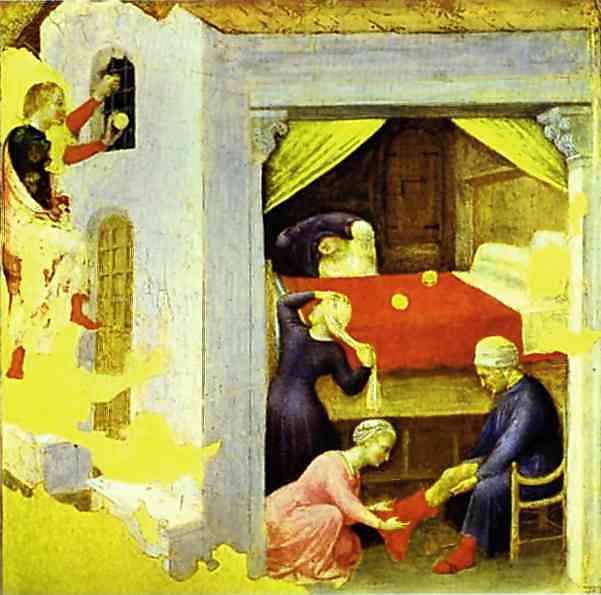 Saint Nicholas was rich, and he used his wealth to relieve the poverty of those in his ministerial care. Truly, Saint Nicholas excelled in the grace of giving, taught in 2 Corinthians 8 and 9. His example can help us learn how to live out the teaching of this passage. It seems to me that due to the Reformed tradition’s utter rejection of corporate recognition of such great saints from church history, depriving ourselves and our congregations of their gifts and graces, are we not also neglecting a sense of communion with those professing Christians, whether Protestant or Catholic, who do recognize these days? 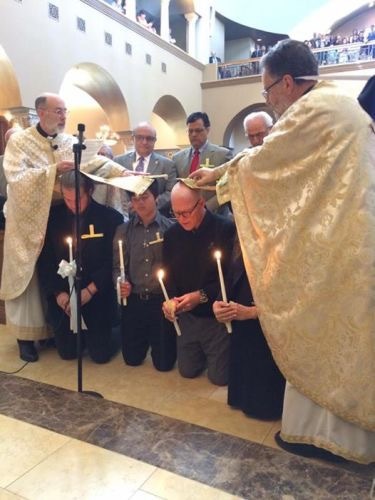 We may be appropriately divided from Roman Catholics and Orthodox Christians over essentials like justification by faith alone, or other Protestants over important doctrines like the sovereignty of God in the gospel, ecclesiology and the sacraments, but we can at the very least affirm the validity of, rather than despise, their edifying themselves with the gifts and graces of the saints of the past. We could furthermore, I propose, go a step further by not only affirming them in their commemoration, but perhaps exemplify a “more perfect way” of doing so in the context of Reformed theology, piety and practice. Many Reformed churches are happy to commemorate Reformation Day on a yearly basis. We promote our commonly held Protestant distinctives, displaying our unity with Lutheran, Anglican, Methodist and Baptist Protestants. We also take it a step further and do it in a Reformed way. If we can do it with the memory of the works of Saint Martin Luther, why can we not do it with others like Saint Nicholas? Today is Saint Nicholas Day. December 6 is the anniversary of his death. It is on this day that Orthodox, Catholic, Anglican and Lutheran churches commemorate his life and ministry in their various ways. Yet the Reformed ignore it, although many of them have borrowed from the Anglicans at Christmas and found a way to bring into greater conformity to the Refomred confessions the Anglican Service of Lessons and Carols. I say we should find a way to bring into greater conformity to our confessions the commemoration of the life and ministry of Saint Nicholas (read all about him here) and so reform in a more winsome and attractive way, the commercialized specter of Santa Claus, rather than merely turning up our noses to it and saying “Bah! Humbug.” Saint Nicholas is the world’s favorite saint. Sure, they’ve refashioned him in their own image, but we shouldn’t just leave him to them. Let us keep alive the true Saint Nicholas, who currently enriches our Christmas seasons with his emphasis on sacrificial generosity to the poor, and perhaps, through such edifying efforts build bridges over which some of the elect may find their way into the communion of saints through faith in Christ by the power of the Spirit and love for one another, and we can learn from Saint Nicholas how to better minister to the needy among us, as well as in the world, without feeling like we’re capitulating to some liberal “social gospel” or postmodern version of progressive “social justice.” Let us reform Saint Nicholas day and perhaps in his providence the Lord will use us to reform the way Christian charity is done in a more perfect way. 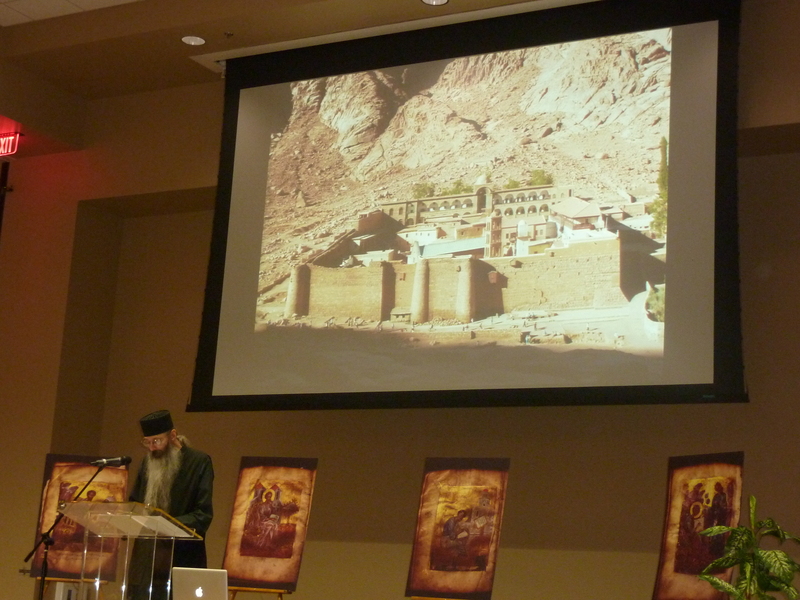 The following is the lecture delivered on Tuesday night, November 8, 2011 at a symposium on the St. Catherine’s monastery library and the significance of the Sinai manuscripts, hosted by Dr. Daniel B. Wallace and the Center for the Study of New Testament Manuscripts at the Hope Center in Plano, Texas. 1 The history of a Christian and monastic presence at Sinai begins not in Byzantine times, but extends back into the years of late classical antiquity. One of the earliest narratives to come down to us from that time is Ammonius’s account of the Forty Martyrs of Sinai and Rhaithou. There, we read about monks who had been living in the Sinai deserts ‘for forty years, and for fifty, and for sixty, and for seventy years, who have dwelt in the same place.’ We also read about a monk named Moses, who was admired by all for his zeal and for his grave manner of life. 2 ‘A certain Moses, having adopted the discipline of monasticism from his youth, practised monasticism for seventy-three years in that mountain from which springs of water issued.’ ‘And this saint, from the time that he took the habit of Christ, ate no flesh, but he ate dates only.’ ‘The food of that saint was a few dates, and water only. And he never tasted wine. And his dress was of compressed palm fibre. And he loved silence more than all men.’ From the many miracles that God wrought through him, all the inhabitants of Pharan had come to believe in the Holy Trinity, and received holy Baptism. I was in Rhaithou in July a few years ago. The temperature registered 118 degrees Fahrenheit. A hot and searing breeze blew from across the Red Sea. It was yet another small insight into the heroism of the monks who lived there in centuries gone by. 3 The historical events described by Ammonius allow us to date his account to the year 373. Thus when he describes elders who have dwelt there as monks for sixty, for seventy, and more years, we understand that there was already an established monasticism at Sinai and Rhaithou at the end of the third and the very beginning of the fourth century, when persecutions were still raging against the Christians. Even then, there dwelt ascetics in the Sinai deserts who were established in virtue, who had attained to the pinnacles of prayer and spiritual graces. 4 Another important early text is the travel account of Egeria, who made a pilgrimage to Jerusalem, after which she continued on to Sinai, around the year 383. She worshipped at the chapel on the peak of Sinai, and at the cave of the Prophet Elias below the peak, after which she descended into the valley, to the Church of the Burning Bush. 5 She writes, ‘there are many cells of holy men and a church on the spot where the bush stands; and this bush is still alive today and gives forth shoots.’ The monks celebrated the Liturgy for the pilgrims, and read for them those passages of scripture concerning the events that had taken place at each site. They also presented them with fruits from their gardens. From the fourth century, Sinai was a place where monks lived in solitude and austerity. But it was also a place of pilgrimage, and these two strands have continued throughout the history of the area, even to our own day. The inscription on the one beam commemorates the Empress Theodora as having passed away, while the inscription on the other commemorates the Emperor Justinian as still living. We know that the Empress Theodora died in the year 548, while the Emperor Justinian died in 565. These two dates provide the terminus post quem and the terminus ante quem for the completion of the basilica. Is it possible to make the dates even more precise? 9 Procopius, in his work On Buildings, mentions that at the base of the mountain where Moses received the Laws from God, the Emperor built a very strong fortress, with a church dedicated to the Mother of God, to enable the anchorites who dwelt there to pass their lives therein praying and holding services. Many scholars feel that Procopius’ On Buildings was completed in the year 554/5, though others have argued for the date 559/60. Even the latter would allow us to narrow the date for the completion of the basilica to within a span of twelve years. 10 A Greek plaque on the west wall of the monastery refers to the completion of the monastery in the thirtieth year of the reign of the Emperor Justinian, which would be the year 557. Although this particular inscription is not early, it may have been based on earlier records. The date indicated is in keeping with the other dates that we have seen. This same Abbot Longinus is portrayed in one of the medallions of the mosaic, with a white square placed behind his head as an indication that he was still living at the time. In the years we have been considering, the fourteenth indiction would have fallen during the years 550/1, or 565/6. The latter date is the more probable for the completion of the mosaic. The entire subsequent history of Saint Catherine’s Monastery may be said to have been written between the ruling lines that we have now traced. 12 The Persians sacked Jerusalem in 614, but it was not worth their while to come to this remote site. Its very isolation protected it. Islam came to the area in the year 632. But Moslems also revere Sinai as a sacred mountain, and the monks found a way to live in peace with their new rulers. The monastery continued as it had of old. Ascetics came to this desolate wilderness and reached great spiritual heights. Their writings have been treasured by Christians throughout the world ever since. 13 The most important book to be written at Sinai is called The Ladder of Divine Ascent, in which the author took the ladder that Jacob saw extending from earth to heaven as the motif for the spiritual life. Saint John of the Ladder was abbot of Sinai in the late sixth century. Before being elected abbot, he had lived as an anchorite for forty years, during which he spent his time saying prayers and copying books. This is an indirect witness to the production of manuscripts at Sinai. Precious manuscripts were also brought to the monastery over the years. 14 The library contains 3304 manuscripts, written in eleven languages. These are predominantly Greek, Arabic, Syriac, Georgian, and Slavonic. The manuscripts range in content from copies of the Scriptures, services, and music manuscripts, to sermons, writings of the Fathers, lives of the Saints, and books of inherited spiritual wisdom. The library also includes medical treatises, historical chronicles, and texts in classical Greek, which is the pinnacle of the Greek language. 15 A few of the manuscripts are splendid works of art, with gilded letters and brilliant illuminations, created in Constantinople in the tenth, eleventh, and twelfth centuries, when the City was at its height as the centre of culture and devotion. But no less significant are the humble manuscripts written at Sinai, often on reused parchment, bound between rough boards, the pages stained from long use, a witness to the deprivations and austerity of Sinai, to the generations of monks who have maintained the life of devotion and the cycle of daily services at this holy place. 16 Aramaic was the language spoken in Palestine at the time of Jesus, and there are a number of Aramaic words and phrases preserved as such in the Greek New Testament. Καὶ κρατήσας τῆς χειρὸς τοῦ παιδίου, λέγει αὐτῇ· Ταλιθά, κοῦμι· ὅ ἐστι μεθερμηνευόμενον· τὸ κοράσιον, σοὶ λέγω, ἔγειραι. In Saint Paul’s First Epistle to the Corinthians, he quotes the Aramaic word Maranatha, which means ‘Come, O Lord,’ or, ‘Our Lord is come’ (I Corinthians 16:22), a prayer that must have been familiar to them, and which goes back to the first Aramaic speaking Christians. A number of manuscripts survive in Christian Palestinian Aramaic, the earliest dating from the sixth century. They are written in a Syriac script, though Syriac and Aramaic are different languages. 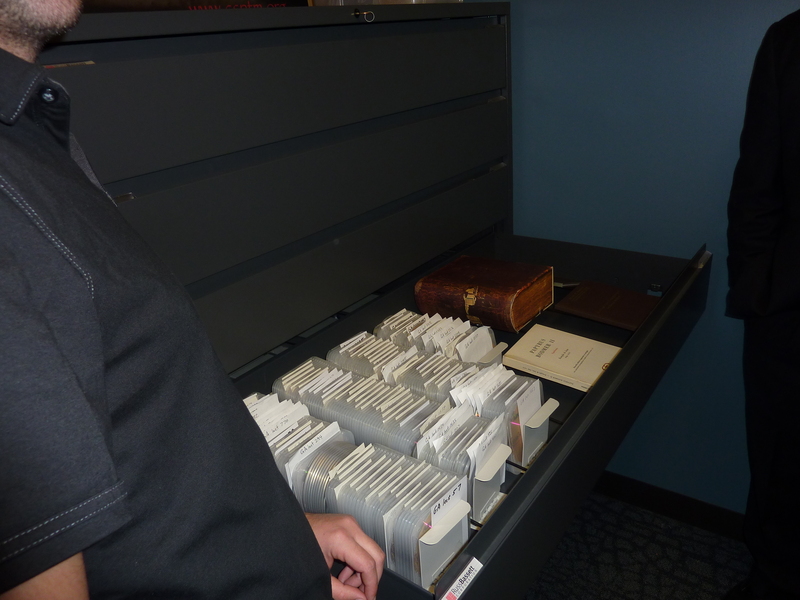 The texts are mostly copies of the Scriptures, liturgical texts, and lives of the Saints. Centuries ago, the Sinai manuscripts were kept at a number of different places within the monastery. Some of the oldest were stored in a room in the tower of Saint George, which projects off the north wall of the monastery. In 1734, Archbishop Nikiphoros Marthales created rooms opposite the Archbishop’s quarters for the manuscripts, and asked that they be gathered there from the various areas where they had been stored before. We know now that manuscrips that were already in a ruinous state, as well as loose leaves and fragments, were left behind in this tower room. Some time later, the roof above them collapsed. There they remained until 1975, when one monk was carrying out repairs to the tower, and came across this deposit of manuscripts. They are collectively known as the New Finds. Among them were a number of manuscripts written in Christian Palestinian Aramaic. A manuscript that dates from the seventh or eighth centuries contains the Sayings of the Desert Fathers, number 59 in the collection. 17 One of the most beautiful is a Lectionary dating from the thirteenth century, manuscript number 41. 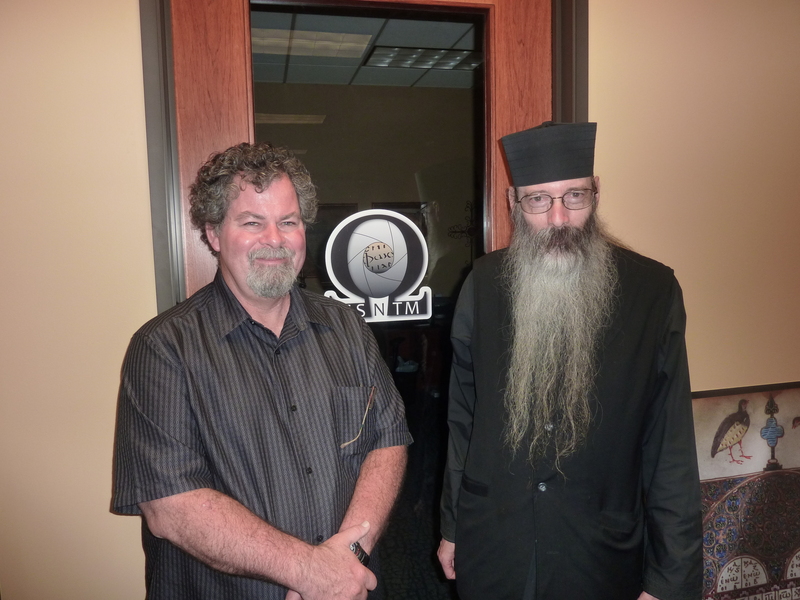 Professor Alain Desreumaux, from Paris, is a recognised authority on texts written in Aramaic. He visited the monastery during the first week in June of last year, and spent some time studying these manuscripts. 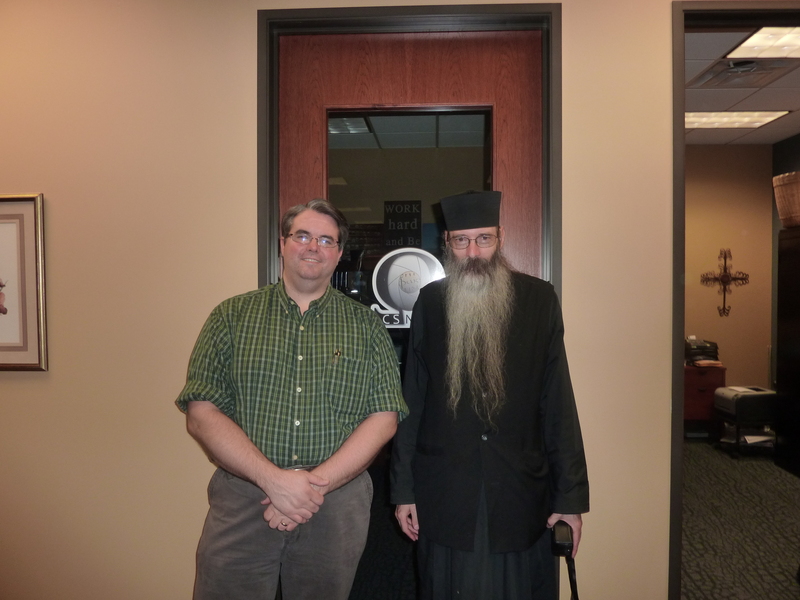 He is even now editing and publishing them, thus adding to the number of known texts in Christian Palestinian Aramaic. The writings of Dionysius the Areopagite consist of four treatises and ten letters. The four treatises are The Divine Names, The Mystical Theology, The Celestial Hierarchy, and The Ecclesiastical Hierarchy. Although these works pass under the name of the Athenian who was converted by the Apostle Paul, as mentioned in Acts 17:34, the works are not referred to before the close of the fifth century. Earlier controversies over the reliability of these writings were set aside when they were confirmed by Maximus the Confessor, and quoted by the Lateran Council held in 649. They were translated into Syriac by Sergius of Reshaina, who died in 536. In 827, the Byzantine Emperor Michael II sent gifts to Louis the Pious, among them the works of Dionysius the Areopagite, and Hilduin, the chaplain of the king and later Bishop of Paris, had them translated into Latin. In 858, Scotus Eriugena made a new translation into Latin. From this, they became known and influential in the West. These writings remain of the greatest importance even today in the Orthodox Church. 18 The oldest surviving manuscript in the world of the works of Dionysius the Areopagite is Sinai Syriac 52, a manuscript of the sixth century, that is, the very century in which these works were first translated into Syriac, and the century following their first emergence. The Hungarian scholar Istvan Perczel had edited the works of Dionysius included in this manuscript, working from the microfilm that was made by the Library of Congress in 1950. But there are areas of the manuscript that were damaged or stained, and these were illegible in the microfilm. He came to Sinai for the first time in July of last year, and was able to study the manuscript in some detail. From his reading of the original, and from the high resolution digital images that we were able to take and send him, he hopes to make a new edition of the text. We know from the enumeration on the first folio of this manuscript that it is missing the first two quires. But an additional six folios from this manuscript turned up in the New Finds, and there are also folios belonging to this manuscript in Paris and Milan. Between all of these, the first two quires are complete, forming the Introduction to the translation made by Sergius of Reshaina. 19 The Codex Sinaiticus has been called the world’s oldest Bible. It was written around the year 325, by professional scribes using the finest parchment. It originally consisted of 740 leaves, and contained the whole Bible, from Genesis to Revelation, and in addition, two early Christian writings, the Epistle of Barnabas, and the Shepherd of Hermas. Sadly, due to Constantine Tischendorf, the leaves of this manuscript are now dispersed among four different institutions: the British Library, the library of the University of Leipzig, the State Library of Russa at Saint Petersburg, and Saint Catherine’s Monastery at Sinai. The Sinai leaves were recovered with the New Finds, and consist of twelve entire leaves, and fragments from an additional four. Although the monastery has always regretted the loss of this manuscript, in 2005 we began a collaboration with the other three institutions, setting aside our differences to accomplish something so important: the conservation of the original leaves, and their publication, both on the internet and in facsimile, together with a complete new transcription of the entire manuscript. In this way, the leaves would be virtually reunited, and made accessible to scholars and students around the world. 20 The conservation of the leaves and fragments at Sinai was carried out in May of 2008, and the following month, scholars came from England to transcribe the texts. They read from the original leaves, sometimes backlighting them to be able to make out faded or damaged letters. But there were times when high resolution digital photographs revealed more of the text, and using these images, they could consult with other scholars about complex passages, especially those passages where there had been multiple corrections. The manuscript and transcription were posted on the internet in July of 2009, and the printed facsimile became available in January of this year. In July of 2009, we were able to make an important announcement about this manuscript. Three years earlier, conservators completed a survey of the Sinai manuscripts, recording the state of each volume, and taking photographs of the bindings. Nikolas Sarris, a Greek from Patmos, used these photographs to study the tooling of the manuscripts. From the decorative stamps used in the bindings, he was able to reconstruct which manuscripts were bound in the same workshop, and determine whether the bindings were executed elsewhere, or made at Sinai itself. 21 He brought to my attention one of the photographs made during the survey. This was Sinai Greek 2289, and he knew from his research that it was one of a group of eighteen bindings made at the monastery in the first quarter of the eighteenth century. 22 On the inside back board, the paper lining had been partially torn away, revealing a parchment with Greek majuscule script. Was it too much to hope that this was yet another fragment of the Codex Sinaiticus? The more we examined it, the more convinced we became that indeed it was. The text is from the first chapter of the book of Joshua, the eleventh verse, in which Joshua commands the children of Israel, ‘Prepare you victuals; for within three days ye shall pass over this Jordan, to go in to possess the land, which the Lord your God giveth you to possess it.’ In every detail, this fragment seemed to match the Codex. But the monastery has other leaves of the Codex Sinaiticus from this same book, which would have been written by the same scribe. 23 When we juxtaposed the letters from these leaves over the image of the newly revealed fragment, the exact correspondence seemed further confirmation of this identification. It was universal practice in earlier centuries to use parchment fragments in repairing or binding other texts. But now we are presented with the daunting task of wanting to reveal the whole of this fragment, without the risk of damaging it in the process. Experienced conservators will need to discuss the safest way to recover this leaf. It may be that advanced scanning techniques could reveal more of the text, without attempting to remove the fragment for the time being. We should not rule out the possibility of simply leaving the fragment as it is, waiting for technology to develop. This would be better than to act in haste, and risk damaging or losing the text. But this manuscript remains extremely important for another reason as well. The oldest manuscripts at Sinai are written on parchment. Even after paper reached the Arab world in the tenth century, parchment remained the preferred writing material. Parchment is made from the skins of calf or sheep, in a process that is highly specialized. As a result, parchment has always been expensive, and often difficult to find. But it can be used to produce a book that is beautiful, and that will last for centuries. If a text written on parchment is no longer wanted, the writing can be rubbed off, and the valuable parchment used a second time. The original writing remains faintly visible beneath the second text. This is what is known as a palimpsest. Because Sinai was so remote, there are many palimpsests: some one hundred and ten manuscripts contain leaves with an underlying text. 25 Very often, it is this original text that is of the greater interest to scholars. If the original writing was large, and if the second text was written at right angles, it is possible with some patience to make out the underlying text. But more often, this is not the case, and the original writing can remain elusive. In the late nineteenth century, it was customary to apply chemicals to the page, to try to enhance the faded ink. A common reagent was hydrosulfurate of ammonia. There were times when this made it easier to read the original script, but one also risked damaging the page, and ruining it. Recent advances in digital photography techniques promise to make these texts more legible. Pages are photographed using narrow wavelengths of light, ranging from infrared to ultraviolet, in what is called multi-spectral imaging. Photographs taken at specific wavelengths are often combined, and image processing algorithms are applied, the same techniques used to enhance the faint images of stars and galaxies in outer space. Results are not always certain. Also, it is not only technology that is required to recover the texts. It still requires the sharp eyes and long training of experienced scholars to decipher the resulting image. 26 Leading scientists in the field came to Sinai in September of 2009 and took photographs for a pilot project. The results were encouraging, and they have been promised funding for a five year project to photograph manuscripts in their entirety and make them available to scholars. Even the pilot project revealed important discoveries. Historians have pointed to surprising parallels between earliest Egyptian monasticism, and earliest Irish monasticism. This can be seen in the architecture and the organization of Irish monasticism. We also know that the Irish retained a knowledge of Greek after it had been lost elsewhere in the West. Seven monks from Egypt are said to be buried at Disert Ulidh in Ireland, and the Bibliothèque Nationale possesses an Irish guide for the use of pilgrims to Scetis in Egypt. 27 At Sinai, we only have one Latin manuscript, a Psalter thought to have been written in Jerusalem in the tenth century. But among the New Finds were manuscript leaves written in Latin, in Merovingian and Visigothic hands. One of the most exciting discoveries was an Arabic manuscript that seems to date from the ninth century, making it very early for an Arabic text. The manuscript is itself made up of a patchwork of smaller pieces of parchment, many of which are palimpsests. It contains both classical and Biblical texts in elegant majuscule Greek. It also contains texts in Latin, and one of these hands has been identified as written in an Insular script. This is a term used to classify a style of writing that began in Ireland in the seventh century, and then spread to England, where it flourished between AD 600-850. This was the age of Aidan and Cuthbert and Bede, the time of an unusual flowering of monasticism in England. Now, for the first time, we have manuscript evidence of direct contact between this world and Sinai. This is evidence that their horizon did not stop at Rome. And, can we say? one of the reasons for this flowering would have been their direct contact with the wellsprings of monasticism in Egypt and Sinai. 28 We have looked at four manuscripts that have been studied recently by scholars, as an indication of the continuing importance of the Sinai library. In each case, digital photographs of these manuscripts proved extremely helpful in their study. The photographs we have seen were made with a system that was acquired some years ago. It consists of a large format camera made by Sinar, with a six megapixel digital back. 29 To take photographs, we use a cradle made in London by Alan Buchanan, which was especially designed for the photography of fragile manuscripts. The manuscript never opens more than 90 degrees. It rests open naturally, and the spine is fully supported, for the cradle turns, from first page to last. As pages are photographed, the platen opposite the camera is incrementally recessed, so that the distance between the camera and the manuscript remains the same. This maintains the focus, and ensures that all of the resulting photographs are uniform in size. Using this camera, we have been able to photograph over one hundred of the Sinai manuscripts. This camera still takes excellent photograph, and will continue to be a useful part of our project. 30 But just last week, we completed the installation of a second camera, that will allow us to expand our project. The installation was made by John Stokes, of Stokes Imaging, in Austin, Texas. The new camera has a 48 megapixel Dalsa CCD. In multi-shot mode, it can capture full colour images in resolutions of up to 192 megapixels. Such photographs are 1.25 gigabytes in size. The new system is not only a great advance in the resolution of the images it can capture. It is also much more efficient. 31 John Stokes licensed the way in which the other cradle supports the manuscripts, and then improved it. 32 The platen opposite the camera moves on a track, which ensures that it is always perpendicular to the camera. 33 It is a simple operation to raise the wedge, turn the page, lower the wedge back into place, and 34 place the new page in position to be phhotographed. 35 The platen is always positioned so that it does not exert any pressure on the manuscript. On our first volume, we were able to average over one page per minute. 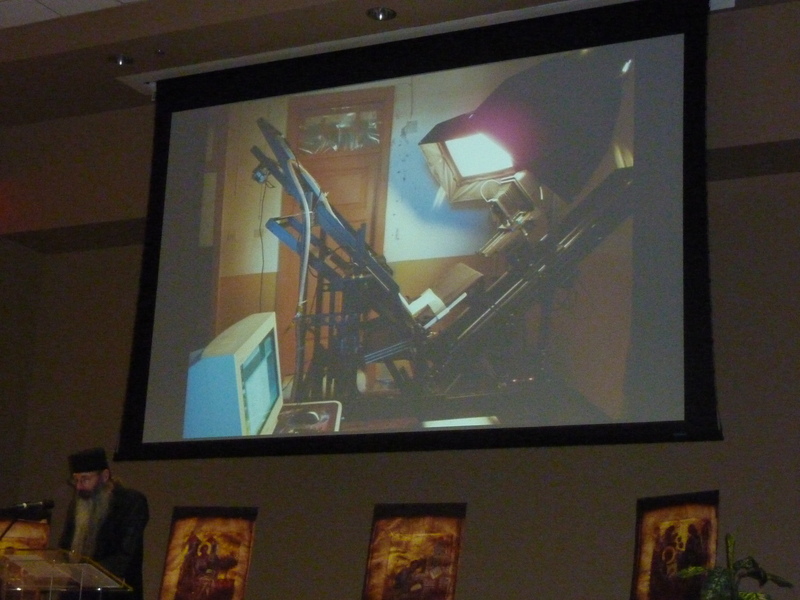 This allows for the careful handling of the manuscript, and for the time it takes the computer to save each image. When I return to the monastery in November, I will be bringing with me new lighting systems that employ LED units, with the colour spectrum matched to the CCD. This avoids the fatigue of using flash for extended periods of time. 36 The first manuscript we photographed was an Arabic typikon, giving the order of service, that had been requested by a scholar in Germany. The resulting images were straightened and cropped automatically as a part of the image processing, so that all of the resulting photographs are consistent. They were also automatically saved in three different formats: the full archival image in TIFF format, a derivative in full size, but in a compressed JPEG format, and a small thumbnail image that could be mounted on a web site. 37 We also always photograph the binding of each manuscript. 38 At full resolution, scholars can study many of the details of the binding structure. 39 To test the system at its highest resolution, we photographed a rare illumination of King David that is a part of a Syriac translation of the Book of Kings, dating from the seventh century. 40 The resulting image allows one to see the smallest detail. This is useful not only for the study of the illumination. It is also important as a conservation photograph, allowing one at a future date to check the state of the illumination. We will continue to meet the requests of scholars as they send us requests. But with the expansion of our digital photography program, we also want to embark on a more systematic photography program. We want especially to photograph all of the Arabic and Syriac manuscripts of the library. We are pleased that there has been a resurgence of interest among scholars in these manuscripts. This would also do much to remind Christians in the Middle East of their own rich heritage. Agnes Smith Lewis, ‘The Forty Martyrs of the Sinai Desert and the Story of Eulogius, from a Palestinian Syriac and Arabic Palimpsest’, Horae Semiticae no. IX (Cambridge: Cambridge University Press, 1912), pp. 4-5. See also Christina Müller-Kessler and Michael Sokoloff, ‘The Forty Martyrs of the Sinai Desert, Eulogius the Stone-Cutter, and Anastasia’, A Corpus of Christian Palestinian Aramaic, vol. III (Groningen: Styx Publications, 1996), pp. 21-28. Heinz Skrobucha, Sinai, translated by Geoffrey Hunt (London: Oxford University Press, 1966), pp. 20-27. Egegia: Diary of a Pilgrimage, translated by George E Gingras (New York: Newman Press, 1970), p. 55. The Greek text for this and the following inscriptions are taken from Ihor Ševčenko, ‘The Early Period of the Sinai Monastery in the Light of its Inscriptions’, Dumbarton Oaks Papers, volume 20 (1966), pp. 262‑3. Procopius, On Buildings, V.viii.5-6 . Averil Cameron, Procopius and the Sixth Century (Berkeley: University of California Press, 1985), pp. 9-11. Hikmat Kachouh, The Arabic Versions of the Gospels: The Manuscripts and Their Families (Birmingham: The University of Birmingham, 2008),Vol. 1, p. 376. H V Morton, Through Lands of the Bible (London: Methuen and Co. Ltd, 1938), pp. 125-6.